A decade ago, Kevin Conroy took the CEO job at Exact Sciences, a cancer diagnostic firm on the brink of death. Five years later, the FDA greenlit the company’s first product, Cologuard, which marked the first non-invasive, stool-based DNA screening test approved for detecting colorectal cancer. In the five years since then, Exact (NASDAQ: EXAS) says it has screened 2 million patients for the disease. The Madison, WI-based company has grown to more than 1,600 employees and almost $500 million in annual revenue, and it currently sports a market value of more than $11 billion. “Looking back, it’s incredibly gratifying, particularly in light of the impact that we’re seeing today,” Conroy (pictured above) says in an interview, reflecting on Exact’s journey over the past 10 years. Exact points to estimates that suggest Cologuard may have helped detect as many as 9,400 early-stage cancers and around 64,000 pre-cancerous polyps in patients to date, based on the cancer detection rate Cologuard has demonstrated in clinical testing. “That’s really moving the needle,” Conroy says. Exact finds itself in an enviable position. The company’s sales swelled 71 percent last year to $454.5 million, and Exact executives and some outside financial analysts predict the firm’s annual revenues will surpass $700 million this year. 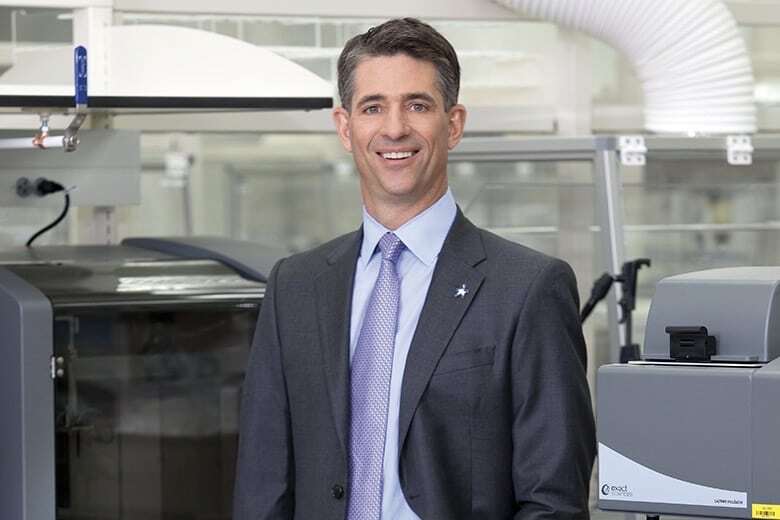 Eventually, Conroy thinks Exact can reach $6 billion in annual sales of Cologuard and capture more than 40 percent of the colorectal cancer screening market in the U.S.
Conroy and his team know the company can’t rest on its laurels. In addition to ramping up Cologuard sales and marketing, Exact’s leaders hope to win FDA approval this year to make the product available to patients age 45 and older, rather than the current 50 and up. Exact is also developing an enhanced version of Cologuard. That could take years to bring to market though, in part because Conroy has said the company is considering running another 10,000-patient clinical trial for “Cologuard 2.0,” as it did to support commercialization of the first Cologuard product. Meanwhile, Exact is also developing experimental diagnostic tests for other cancers, including work being done in partnership with Mayo Clinic. The company’s liver cancer diagnostic research has made the most progress, Conroy says. Exact has run three case-control studies of blood-based biomarkers to detect liver cancer, he says. The goal is to begin a prospective study in the first half of 2019. There’s a lot of work ahead to bring these products to the finish line, and no guarantee of success. Plus, all of this will cost money. But that’s apparently not a concern for Exact, which had $1.1 billion in cash and “marketable securities” on hand as of the end of 2018.